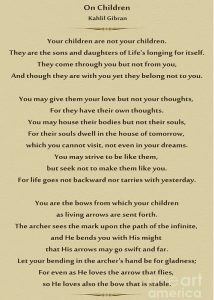 On Children Poem by Khalil Gibran extracted from the poet Khalil Gibran work ‘The Prophet’ which is his best known work. Ans: C. Parents should not be possessive of their children. 4. According to the prophet, what may be given to the children? Ans: According to the prophet, the parents can only give their children love and affection. 7. ‘For even as He loves the arrow that flies, so He loves also the bow that is stable‘. Discuss the contrast between the underlined words. Ans: The poet (the prophet) implies that ‘flies’ means to move to a future. He tells the parents that God loves the children just like their parents and the children move away from this parents seeking a better future, to pursue their dreams. But parents having achieved what they have are ‘stable’ satisfied with whatever they have gained or earned. 1. Why does the prophet categorically state ‘Your children are not your children’? Ans: The poet categorically stats that the children are not your children because as soon as a child takes birth, it has its own individuality, his own likes and dislikes, the profession his parents do, though he loves and respects them. As he grows older he may marry a girl of his liking and move away from his parents to raise his own family. He will want to live a life according to his own will and wish. The poet emphasis that though children are by humans, they act as directed the Almighty God. 2. What does the metaphor, bows and arrow signify with regard to parent-children relationship? Ans: He compares parents and the Almighty to a ‘Bow’ and children to an ‘Arrow’. Just as we use a bow to shoot an arrow at a target, God uses men as a bow to bring children into this world. Here women bear children, nurse and nurture them; God will direct them like an arrow to reach their goals or targets. 3. According to the prophet, what attitude should parents have towards their children? Ans: The prophet asks the parents not to own their children and direct their lives and dictate terms or conditions on them. They should be left free to pursue their own dreams and desire and to not thrust the parents dreams and desires on them. As children outlive their parents’, it is wise for parents to let their children to create their own destiny as God Almighty will always be there to guide them into a bright future. Ans: A. The older generation. 2. In the light of the ‘On Children Poem‘, think of different levels of freedom children must have in shaping their lives. Ans: Children should be allowed the freedom to make their own future. The love and affection of parents should not deter the children to leave them and go out to seek their own destiny. Mothers should not control their child’s destiny. When children are not allowed to exhibit their creativity, the progress of nation suffers. As children live in the future, it is better left to them to seek their own destiny. If a child wants to be a soldier when he grows up, you must allow him to be a soldier, and not force him to be a doctor. He may not be interested in that profession. His creativity and productivity will decrease. Then it will be of no use to the society. We should nurture our children’s dreams of their future and help them to achieve it. They will be thankful to us and respect us more as parents. 3. The poem does not focus merely on the lives of children, but also talks about the responsibility of parents. Do you agree? Ans: Yes, I agree that the ‘On Children Poem‘ does not focus merely on the lives of the children but also talks about the responsibility of the parents. A lump of clay can be shaped into any shape i.e., they can be shaped into a pot, a cup or a beautiful idol. In this way, the children can be compared to a lump of clay, it is the responsibility of the parents to shape the lives of their children according to the talents and dreams of their children. They should be taught good values and it is the responsibility of the parents to make their children good citizens of the country. So that the world becomes a better place to live in.